Hosted by Ken Fallon on 2012-08-22 is flagged as Explicit and is released under a CC-BY-SA license. This is the second show from OggCamp12 where I walk around the hardware hacking area. A big thank you to all the people I interviewed and who took the time to explain their project to me. 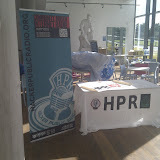 The Oggcamp HPR booth looked great! Thanks for the effort and the pictures. the best show sofar from oggcamp.